Coconut facts, an information sheet for kids cooking activities. Coconut facts and general information about coconuts. Fresh coconuts are available year round but their peak season starts in October. Coconuts grow on a tree. 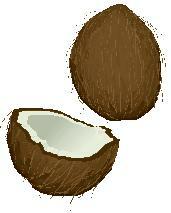 The actual coconut is wrapped inside a hard brown shell called a husk. When shaken you should hear some of the coconut liquid inside. If you dont it is dried up and you should pick a different one. Store at room temperature unless cut open then store in refrigerator. First of all to open you must pierce one of the three holes with a clean screwdriver and pour the liquid out. (You can store this in the fridge but must be used within 1 day). Then crack the surface of the coconut on something hard (have an adult do this!). It may take several times. Bake the drained coconut at 375 degrees for 20 minutes. Allow to cool and wrap in kitchen towel. Hit the coconut with a kitchen mallet to release the meat from the shell. 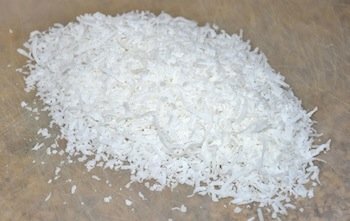 Chop coconut pieces in a food processor or grate into shreds. It takes some work getting the actual coconut meat out but it is a great lesson on coconuts. Not to mention it makes you appreciate the next time you buy that bag of shredded coconut at the store. To toast coconut, spread coconut in a ungreased shallow pan. Bake uncovered in 350° oven 5 to 7 minutes, stirring occasionally, until golden brown. Use for topping pies, puddings, or ice cream. Coconut is high in fiber and Vitamin B. In bowl, combine coconut, sugar, flour and salt. Stir in egg whites and vanilla; mix well. Drop by spoonfuls onto greased baking sheet. Bake at 325 degrees for 18-20 minutes. Preheat oven to 350 degrees. Grease and flour two 8 x 4 inch loaf pans or make into muffins. Combine flour, sugars, pumpkin, oil, coconut milk, baking soda, salt, and spices. Mix until well blended. Fold in coconut, raisins and nuts. Pour into prepared pans. Bake loaves about 1 hour. Muffins should bake about 20-25 minutes or until an inserted toothpick comes out clean. Remove from oven. Cover with foil tightly, and allow to steam 10 minutes. Remove foil and turn out onto cooling rack. Tent lightly with the foil. Allow to cool completely. In saucepan, stir sugar, cornstarch, flour and salt together. Stir in eggs until mixture is well blended. Gradually stir in milk. Cook over medium heat, stirring constantly with whisk, until boils. Continue boiling and stirring one minute. Remove from heat; stir in butter and vanilla. Stir in coconut until blended; pour into baked pie crust. Cover with plastic wrap. Chill 2 hours. Before serving top pie with whipped topping and sprinkle with toasted coconut.